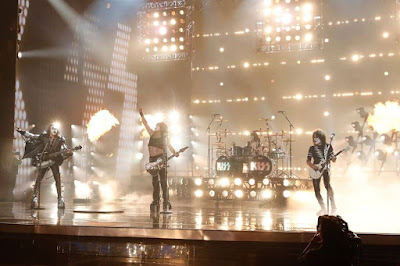 KISS opened the season 13 finale of NBC-TV’s America’s Got Talent on September 19 with a performance of their 1976 classic, “Detroit Rock City”, and confirmed plans for their farewell tour during the broadcast. Set to begin in 2019, the trek is billed as "One Last Kiss: End Of The Road World Tour." "This is gonna be our last tour,” said Paul Stanley on the program. “It will be the most explosive, biggest show we've ever done. People who love us, come see us. If you've never seen us, this is the time. This will be the show." "All that we have built and all that we have conquered over the past four decades could never have happened without the millions of people worldwide who've filled clubs, arenas and stadiums over those years,” added KISS in a statement. “This will be the ultimate celebration for those who've seen us and a last chance for those who haven't. KISS Army, we're saying goodbye on our final tour with our biggest show yet and we'll go out the same way we came in... unapologetic and unstoppable." More information about the tour is expected to be announced soon. KISS was co-founded in January of 1973 by Stanley and bassist Gene Simmons from the ashes of the pair’s previous band, Wicked Lester; they added guitarist Ace Frehley and drummer Peter Criss and made their live debut before a crowd of less than 10 people at the Queen’s NY club Popcorn a few weeks later. By the fall of 1973, the group entered the recording studio to assemble their self-titled debut, which was issued in Feberuary of 1974. Criss exited the group in 1980 and Frehley followed in 1982; both rockers were replaced by a series of members through the years as KISS altered between makeup and non-make-up eras on their way to a temporary reunion of the originals in the late 1990s. The current KISS lineup sees guitarist Tommy Thayer perform using Frehley’s spaceman makeup and stage gear while longtime drummer Eric Singer appears in Criss’ cat makeup and stage persona. With worldwide sales of more than 100 million albums – including 40 million in the United States alone – KISS were inducted into the Rock And Roll Hall Of Fame in 2014.